New Delhi: Around 66 per cent of the total beneficiaries have availed treatment in private hospitals under the Ayushman Bharat scheme with the majority of them being recorded in Gujarat, Tamil Nadu, Chattishgarh, West Bengal and Madhya Pradesh respectively, an official said. Dinesh Arora, deputy chief executive of the National Health Agency (NHA), the apex body implementing the scheme, said till November 26, of the total 3,65,394 beneficiaries who were admitted to hospitals for undergoing various surgeries and procedures, 2.4 lakh have been treated in private hospitals. “The rest 34 per cent availed treatment under the scheme at public hospitals,” Arora said. “So far, the maximum benefits under the scheme have been availed by people from Gujarat, followed by Tamil Nadu, Chhattisgarh, West Bengal and Madhya Pradesh,” Arora said. 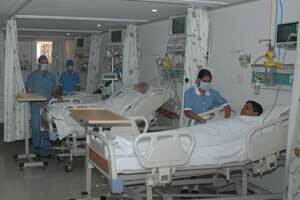 He informed that the NHA has paid an amount of Rs 312 crore for the claims to the hospitals. The Health Ministry has said the scheme will help in reducing expenditure on hospitalisations and help mitigate the financial risk arising out of catastrophic health episodes. Under the scheme, the government aims to provide a coverage of Rs 5 lakh per family annually, benefiting more than 10.74 crore poor families for secondary and tertiary care hospitalisation through a network of the Empanelled Health Care Providers (EHCP). There is no cap on family size and age in the scheme, ensuring that nobody is left out. Over 10,000 hospitals have been empanelled for the scheme, and 33 states and Union Territories have signed memorandums of understanding (MoU) with the Centre for implementing the programme. Punjab, Delhi and Telangana are yet to join the scheme. Some hospital s doing ayushman scheme have no MBBS qualified doctors without hospital registration and waste and fire station registration are allowed to work in scheme. The hospital needs to be checked before allowing surgery.